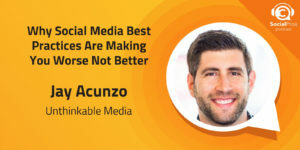 Jay Acunzo, Founder of Unthinkable Media, joins the Social Pros Podcast to discuss moving beyond best practices and his new book, Break the Wheel. “Five Ways to ____.” “How (insert company name) Does ____.” Headlines like this have become so common as more and more businesses seek out social media best practices. There is certainly no problem with taking advice from brands who have found success, but it is always important to remember that you are not them. While there may be wisdom to glean from their experience, we often forget that context plays an equally large role in their achievements. Rather than throwing time and money into imitating these brands, learn what you can from their stories, and focus on your own context. Your business, your products or services, and your audience all converge into a completely unique set of circumstances. Use this to your advantage, and put in the work to develop your own social media best practices. By learning what works specifically for you, you’ll find lasting success on your own terms. Why finding social media best practices shouldn’t be the goal. How to interpret data to gain insight. How to start asking the right questions. How to set an aspirational anchor. Why constraints can help foster creativity. Don’t focus on big numbers, but focus on making a big impact on a small number of people! Jay has a lot of respect for Mike Rowe and the way he applies his principles to everything that he does! Jay Baer: Hey everybody. It's Jay Baer from Convince and Convert. Adam Brown is off this week. 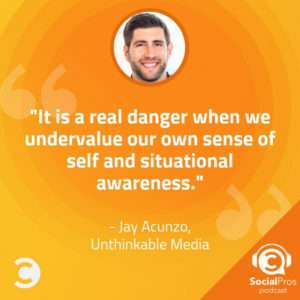 And this week on the Social Pros Podcast, we'll be joined by my friend Jay Acunzo. Jay is the head of Unthinkable Media, a documentary style content organization that creates shows for B to B companies like Drift and Wistia and Divvy. And Jay's also the author of a terrific new book called Break the Wheel: Question Best Practices, Hone Your Intuition and Do Your Best Work. Listeners, you're going to get a lot out of this interview with Jay. He's very smart, very well spoken and really understands how to save you from the curse of social media best practices, how to find the thing that you should be doing better, more effectively, more efficiently. You're going to love the next 42 minutes or so with Jay Acunzo here on the Social Pros Podcast. Jay Baer: Hi friends this is Jay Baer from Convince and Convert and thanks for listening to Social Pros. Our sponsors this week include ICUC. Did you know that every one star increase in your Yelp rating can lead to a five to nine percent increase in revenue. Embracing and engaging with online reviews on Google, Yelp, Amazon, and more will directly impact your business. 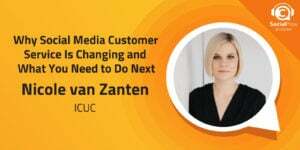 Get your free copy of the new eBook that I created in partnership with ICUC Social. It's called The Customer's Always Right: The Power of Ratings and Reviews. You can get it at no cost. Go to bit.ly/embracereviews. That's bitly/embracereviews. All lower case. Jay Baer: And of course the show is brought to you this week by our friends at Salesforce Marketing Cloud. Social is more important than ever for B to B marketers, yet some have a hard time using it effectively. A new complete guide from our friends at Salesforce will help. It's called The Complete Guide to Social Media for B to B Marketers. It reveals the best types of content to use, how to measure your social more effectively. It is super fantastic. Grab it at bit.ly/socialb2bguide. That's bitly/socialb2bguide. All lower case. And now here's this week's Social Pros Podcast. Jay Baer: On the show this week is my pal Jay Acunzo, who is author of a spectacular new book: Break the Wheel: Question Best Practices, Hone your Intuition and Do your Best Work. Jay is also the founder of Unthinkable Media, a documentary style content creator for companies like Drift, Wistia, Divvy. A terrific interviewer. A very smart man. And a good friend. Jay, welcome to Social Pros. Jay Acunzo: Right back at you, Jay. Thank you so much for having me on. I love the way you approach this show. Jay Baer: Well, thank you. I appreciate that very much. There's something to be said for doing it for damn, man almost 10 years now. Jay Acunzo: Oh my gosh. Jay Baer: It's kind of crazy to think about that. Here's the thing that's ... I just want to throw this out from the beginning. Social media is I think at this point, it's not new in the classic sense. It's kind of all about best practices. In fact, I might argue that this very podcast is about the identification and the perpetuation of best practices within social media. Yet you say in the book Break the Wheel, that finding best practices isn't the goal. Finding the best approach for you is. Can you talk about how that works and what you mean by that? Jay Acunzo: Totally. I think that's a pretty easy statement to get on board with, right. Obviously, you want to do what works best for you. And by you, you could mean myself and my career, my team, this particular channel and project, my company, my industry. In your unique situation find the best approach there is far more powerful than finding a general best practice that somebody says works. Jay Acunzo: So, let's take this show as a really easy example. What I love about shows like this, or just about the education that we all share with each other as marketers, they're all possibilities, which is wonderful. Now it's not that hard to find possibilities, but the danger, Jay, is where we start to misconstrue possibilities as answers, as blueprints, because best practices miss a very vital detail which is our unique context. Jay Acunzo: And when you look at some of the stories in my book or I host a podcast called Unthinkable, so I actually mined about 120 different stories about people who did what looked like outlier work. When you look at these examples of exceptional success in social or marketing or business overall, we tend to think they did something crazy or they have the gift. But then you talk to them, and it's like no, no, no. I just made my decisions based on this specific item, this specific bit of detail in my unique situation. And you think it's crazy because you don't have access to that context. So, it's not that best practices are bad. They're just a fine place to start. But they need to be contextualized. And we don't really talk about how to do that. Jay Baer: Yeah, we really don't. We just sort of take it at face value. Or don't take it at all. One of the things that's true about social media and really all digital marketing I suspect is that we have a tremendous amount of data available. More data than our fore bearers had in the marketing field. I sometimes question whether that's a good thing. Is data and math the enemy of intuition in your estimation? Jay Acunzo: No, and they actually. It's order of operations here. So, if you look at the root of both of those words, data and intuition, all data is is information stored for later use. And the later use part often goes by the wayside, whether it's because you have too much data from too many sources at your company because you're a large organization or our good friend Andy Crestodina in the marketing world talks about if you see a bunch of numbers it's a data dump. If you see plain English, however, that's an insight. Jay Acunzo: So, the point of intuition is to extract an insight from your environment. And when I say intuition, Jay, I just want to clarify. The book has this section in it which is kind of a jaunt through history and all these different interpretations of this fuzzy but powerful idea of intuition. And what we try to do is land on something very practical. Which is basically that intuition is just your ability to stop and consider the world. Which obviously everybody should be doing, but when ... you would think. You would think. When pressure mounts, when something changes, when you get a hasty email from your boss, like hey, what's our Snapchat strategy, or hey, did you see this news article, we have to react to our customer or our competitors new approach. When all these things get thrown at us every day, Jay, we don't often stop to consider the world. And that's a real problem especially if you have a glut of data or best practices or precedent or trendy new tactics. Jay Baer: Yeah. I think it's true for many of our listeners that failure or at least the perception of failure is more common in social than ever before. It used to be just showing up to the party was really all required and then you had to be at least competent and that was fine. Now you have to be something more than competent. You must be strategic and thoughtful and good. It's just not as easy as it used to be. There's a lot of reasons for that that we talk about on the show every week. You describe a phenomenon in the book. And again, this is Jay Acunzo. The book is Break the Wheel. Spectacular. Make sure you get a copy of the book. It's really going to help you be your best self. But you talk about this phenomenon in the book called pike syndrome. And I think it really relates to where a lot of our listeners are now with regards to sometimes feeling like what their doing in social isn't working. Can you talk about pike syndrome and what we can do about it? Jay Acunzo: So, pike syndrome is one of three psychological barriers that I dug up in my research. And when your wife is a clinical psychologist, you have this sneaky advantage writing such books. So, I will throw that out there and I have to credit her in everything I do. Dedication page included. Jay Acunzo: And so, pike syndrome is basically a feeling of powerlessness after repeated failure. And that doesn't mean literally I failed. It could just mean constant stress. It could mean something either chronic or acute. But it's a feeling of powerlessness. And in today's world where we're faced with all these quote unquote right answers, it's like what could I possibly offer that's original or different or anything but incremental. Jay Acunzo: So, imagine ... so, why pike syndrome? That's what everyone's asking right now. What the hell does a pike have to do with our work? Imagine a pike is swimming around in an aquarium. This is actually from an old science experiment, Jay. If you were to drop some minnows into that tank, the pike will eat them right away. Makes sense. You're an outdoorsy kind of guy. You got the boat. I'm sure you fish. Jay Acunzo: These things are ruthless hunters. But if you lowered some minnows into that tank surrounded by glass the pike can't actually see the glass, and so what happens is he just starts to smash up against it over and over and over again. And he'll literally do this for hours until he decides oh, I guess I can't eat minnows. And then you can remove the glass and this is crazy, but the minnows can swim freely around that tank undisturbed by the pike. And the thing that kills me is that tasty little morsels are swimming right in front of his nose and he doesn't move so much as an inch because he's created this feeling of what they call in psychology learned helplessness. Jay Acunzo: And I think in our work, we so often start from a place of learned helplessness. From an early age we taught there's a right and a wrong answer and then we go and approach every even creative or complex task as marketers with the same idea. And with all those right answers out there, what can I possibly do. So, that's the problem. We have tasty little morsels of detail and information and insight swimming in front of our noses every day as marketers. Whether it's our team, our resources, our customers, our unique situation, especially as social media marketers who interact extensively with the audience. All of that information provides insights we can use to inform our decisions. But instead we're seeking our answers out there. And I think that's a real problem. Jay Baer: And I think the pike phenomenon is familiar. It's this idea of the social media algorithms are the glass jar right, that we keep trying to publish content that doesn't succeed and we say oh, the algorithm won't allow it, so now let's just buy ads. But maybe the story isn't buy ads. The story is say something worth saying. And then the glass jar doesn't really matter so much. Jay Acunzo: Yeah, it's funny. Rather than try to make a dud missile fly, maybe build something worth flying and then everything else gets a lot easier. But I think what ends up happening is because someone else said this worked for me or this worked for our organization in the past, we stop updating our knowledge. We're not reaching out for the details that are first hand. We actually under value our own sense of self and situational awareness, which is a real danger. And again, coming back to our work as social media marketers, we are on the front lines, quite literally. It is not us in an office somewhere, I hope, just pontificating and brainstorming, Jay, so what ends up happening is we can let the customer be the guide. We can extract insights from real world interactions. But there we go again listening to some list of tips and tricks and failing to actually contextualize or update our knowledge. Jay Baer: Your book talks a lot about asking the right questions. And I love how you think that through. What would you say are some of the right questions to ask when people are trying to maximize social media effectiveness? Jay Acunzo: So, I'll give you an example. So, I think by now we're all familiar with Merriam Webster. If we're not, go check them out on Twitter and Instagram in particular. Especially Twitter. Unbelievable. Now so, it's the dictionary. Asking the dictionary to be cool in the digital age, I think Jay, is akin to trying to teach your grandma how to twerk. So, I don't want to do that job. Jay Baer: That's a video I would share. Jay Acunzo: Like, no, no, no. Don't make me do that job. No chance. No how. It's not going to happen and I'm super uncomfortable just thinking about it. No way. And I talked to a woman who is their chief digital officer, who should absolutely be on everybody's radar. Her name is Lisa Schneider. And she's in the book and she tells this great story about how when she first arrived, they were doing this conventional approach on Twitter where in the morning they would post a word of the day and at night a quiz over and over and over again. And in her words, see when you work for dictionary, you're pretty good at synonyms and you don't really need a thesaurus. So, she's like we were bland, predictable, and staid. And I was like oh yeah, you definitely work for ... staid, I love that. And I was like well, what was the problem. And she said well, internally our team was, ready for this, witty, warm, and wonderful. Just beautiful alliteration. Jay Baer: She likes to speak in triplet I think. Jay Acunzo: Oh, yes. So, I was like okay. So what best practice, what trend, what technology did you use to solve that problem. And she said well, I looked at our team and I looked at our work and I said let's show the world how fun and relevant we really are. Not let's grow out Twitter followers 50% month over month, which doesn't inspire anybody. Not let's go viral, which I know we're still saying. And it's oh, my gosh, it's 2018. #no. Not a strategy. Instead, she articulated what I called in the book a aspirational anchor. She said what is our aspirational anchor. Jay Acunzo: And when you set a goal Jay, you usually just put a mile marker in front of you and that incentivizes at all cost behavior. It doesn't matter what we do to get there or how we do it. And so we start reacting. We start globbing on to anybody's secrets and tips and tricks and cheats. But an aspirational anchor has this built in motivation and inspiration into your goal. It combines two things, your intent for the future. So, for Lisa, let's be part of the conversation. And, and this is crucial, your hunger. Some kind of dissatisfaction you have with what's happening in your work today. And for her it was well, our voice is too bland. So, let's show the world how fun and relevant we really are. Jay Acunzo: And within a year they grew their social media reach 6,000%, their press mentions 7,000%, because I mean who the hell was writing about a dictionary in the press right? And she won't release the numbers publicly, but she did confirm that this actually grew their revenue significantly. And now they're this darling of social media after being quite literally like a dusty book on a digital shelf. And it all came back to this fact that she asked herself well, what is our aspirational anchor and that set up this filter through which she could press any tactic or any idea. It turned all these best practices from answers to possibilities. Jay Baer: That's what Tom Webster, who's been on the show from Edison Research calls the theory of the firm. Jay Acunzo: Yes. Jay Baer: Why do you exist and everything filters out from there. Jay Acunzo: And you might say, Jay that Lisa was able to actually ignore some very sound advice in someone else's shoes. It didn't make sense for some other brand to show the world how fun and relevant they really are if that's just not their DNA. It's not the authenticity they have with their team. Jay Baer: Okay, all right. Let me ask you then a question about that. Jay Acunzo: Yeah. Jay Baer: I have talked about this on this show a lot of times on this podcast. I've written articles in Ed Week, Ad Age, on my own blog about this. I want to know, in that context, Jay, how you feel about the Wendy's Twitter account. Jay Acunzo: The Wendy's Twitter account. I don't think I'm up on that, give me more. Jay Baer: The Wendy's Twitter account, the same way that Merriam Webster is very pop culture relevant and tweets out definitions to words that are in the public consciousness, the zeitgeist, if you will ... Wendy's Twitter account is committed to being super-duper, incredibly snarky. They're always making fun of other brands, making fun of customers. It's incredibly Mean Girls snarky. Jay Baer: Like Merriam Webster, they've gotten a tremendous amount of media coverage for this very unusual, admittedly hilarious approach. Lots of people say it's a triumph. I say it is not, because it is not a characteristic that is true to the brand. If I go to the restaurant, they're not snarky to me at Wendy's. They're not even snarky to me on Facebook. They're only snarky on Twitter, and that's why I don't like it strategically, but that's just me. Jay Acunzo: I'm scrolling through their feed on my phone right now. First of all, I am with you. I like this as ... This is a cool tone of voice on Twitter, in a vacuum. What I don't like is how it ties, again, to the larger strategy. Again, the whole principle of this book, that the goal is not finding best practices, it's finding the right approach for you, that doesn't mean finding what works in general, and I'm using air quotes, on a channel. It means authentically for the whole- Jay Baer: Yeah, but if that was the case All we'd ever do is post cat videos and be done with it. Jay Acunzo: Right. Jay Baer: Let's break this down into Merriam Webster's story. Let's get deeper, because it speaks to this issue that Wendy's is facing, or that you identified with them so well there, Jay. When I talked to Lisa, she described what a lexicographer does. First of all, do you know that a lexicographer even is? Jay Acunzo: Is a lexicographer a person who determines the background and history of words? Jay Baer: I thought that exact same thing. I thought a lexicographer, which is a dictionary editor, is somebody, like my English Literature background would love, sets the rules that we should abide by. Like the word equivalent of whatever the Oxford comma would be in definitions, right? Not true. A lexicographer, and the word almost sounds like this, they document ... It's almost like a cartographer with maps. Jay Acunzo: When things have been used, and in what context. Jay Baer: Yes. They document what actually happens in popular dialogue. That's why words like on fleek, or phrases like on fleek and stuff like that gets into the dictionary. Jay Acunzo: Get added. Jay Baer: We're all like, what the hell, right? They document ...They have to keep in touch with ... They have to have their hand on the pulse of pop culture, so it makes total sense that the aspirational anchor that they have is, let's show the world how fun and relevant we really are, because that's the job. Jay Baer: That's not ostensibly the job of Wendy's to do that kind of thing, but for Lisa they should be commenting on, if there's a giant political story, if there's a giant sports moment. That's the job, so they started doing more than just infusing tone of voice, which is part of it. They started doing things like announcing the trending look-ups on their site. Jay Acunzo: Yeah, that's great. Jay Baer: When there was a political debate, they had this word come out, and they weren't saying this word is part of the lore of language. No, they were like, this is on the rise because of this pop culture thing. That's brilliant. It's just so ingrained in everything they do, because that's the job. Jay Baer: One of my other favorite stories in the book, and again, folks, this is Jay Acunzo, his new book is Break The Wheel, is about Poo-Pourri, which is the spray that you use in and around your toilet to mask the scents of your own makings. What is interesting about that story in particular, and you mentioned it yourself just a few moments ago, that usually this idea of going viral, and make me a viral video is a fool's errand, right? It never really works, typically. In this case, their videos did go viral. What's the lesson there? Why were they able to do a thing that nobody else can typically do? Jay Acunzo: The word is curiosity. When we talk about switching our approach from trying to be an expert who knows absolutes, to trying to be consummate and lifelong investigators who care about evidence, and asking good questions, Jay, Suzy Batiz, the CEO of Poo-Pourri is the ultimate investigator. She started out with a very simple question, which is why are we not trapping odor at the source, which is under the water? Why are we basically in the odor elimination game with sprays? We should be in the odor prevention game by putting oil on top of the water. That's why they have a company worth over $300 million selling ... I can't believe I'm going to say this on a podcast ... Poop spray. Jay Acunzo: What she's actually done, Jay, is she broke her business into two different halves. She has the, let's say, the status quo half, which is about efficiencies, and yes, running best practices, and making sure that they keep the lights on and maybe have incremental growth. Then she has a whole half of the organization dedicated to asking open-ended questions, and pursuing curiosity. A great analogy that she uses is, when you think of a cell in your body, it's either in growth stage or protection phase. Jay Acunzo: When she was in a startup mode, when she was just starting this company, shooting out crazy viral videos, she could experiment all she wanted, she could be as curious as possible, because there were no stakes, there was no risk. When you start to grow as a business you get into protection mode, and you start latching onto what worked in the past, or what people say is guaranteed to work for you now in the new trend sense. Jay Acunzo: She has a whole half of her organization that, with their videos ... For example, they film multiple intros, and multiple outros for every video they post. They just try all these radically different things. Then, when they find an approach they think is working, that growth idea, or that curiosity half goes to the efficiencies half, to the best practices half and breaks down their doors, their hardened, exterior shells and says, "Hey, this is actually going to work better than what we did in the past." Jay Acunzo: In this way, she's actually built an organization around curiosity, around investigating instead of complacency, instead of expertise, and they never actually get stale. They constantly evolve. Jay Baer: One of the things that I find interesting about your work is, out side of the book, Break The Wheel, a lot of the things that you make, Jay, are audio or video podcasts, video shows and series, et cetera. Do you feel like that is a moneyball approach today that multimedia works best today because, comparatively fewer people are doing multimedia versus text, or do you feel like that's a sustainable scenario into the future? Jay Acunzo: You know it's interesting, because to answer this question, I don't often ... I get this question a lot. I don't address the tactic, because I think we look for the arbitrage opportunities in marketing, which is the moneyball idea. If you just reset to first principles, which is a giant concept behind a lot of the book, we're living through this shift in marketing that we're not talking openly enough about. Which is, it used to be that marketing was about acquiring attention, but today it's about holding attention. 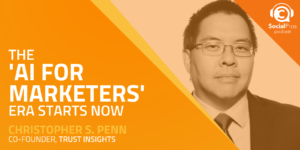 On top of that you have an industry's reaction to that shift that we call things like content marketing, social media marketing, influencer marketing. Jay Acunzo: If you take that fundamental human shift in mind, and you're like, "Okay, it's not enough to get a few eyeballs or seconds, I need subscribers, significant time. I need to provide things that people choose, because consumers have all the choice." What is a vehicle built with the specific and overt goal of holding attention? It's a show, it's a serialized string of content, and shows are only three different things melded together. It's a concept over the whole show, like a journey, statement of why you're doing this and why it's different, or unique or worthy. Jay Acunzo: It's an episode-level structure that has some kind of repetition, episode to episode, to make it identifiable, and then it's talent. You put those three things together, Jay, and all the sudden you're like, I have this vehicle that owns a theme in the market, holds significant attention, and also cascades endless amounts of content to make every other marketing channel more efficient. To answer your question, I think, yeah, it's not only a sustainable and smart approach to make shows along with all the pieces, but it addresses a fundamental human behavior today, or human insight, which is that we have to get better at holding attention, not just acquiring it. Jay Baer: Yeah, so much is, I think, we're still involved in this random acts of content situation, right? Jay Acunzo: Yeah. Jay Baer: Where is just doesn't ... People can't tune in, because they don't really know what to expect from you and when. I completely agree. With the shows we do a lot of work on that topic at Convince & Convert. Clearly, that idea of shows, though, tends to lead you down the path of longer form content, right? You can do short form shows, but generally speaking, the show approach becomes a little bit longer. Would you agree with that? Jay Acunzo: Generally speaking, yes, but again, my book is about not taking generalities at face value and using them. It's about updating it and making more specific. I think that just tends to be where people fall victim to what happened before, because what happened before is, 30 minute TV shows ... Why? We're streaming everything today. 30 to hour-long podcasts. Why? When I talk to a client and I build a show for them, the initial brainstorm is always like, we can either do a Q&A ... I work with B2B brands, and I think every B2B show can be summed up as saying, talking topics with experts. That's one end of the spectrum. Jay Acunzo: Then, the other is NPR, with field reporting, and narration and music. In between you have this huge green field that you can explore. I think the answer is yes. Most people think long form, but there are myriad shows out there, both from brands and media, where there are six to ten episodes. Whether it's the Daily from the New York Times, or The Way I Heard It from a guy I know you love, Jay, Mike Rowe, formerly of- Jay Baer: One of my favorite shows, absolutely. Jay Acunzo: He's six to ten minute stories that he does a little research and writes them. He brings in no extra people, he has a microphone in front of his computer, and he has a show that is crushing it. It's absolutely stunning how good it is, and I use that all the time as an example of, look, this holds attention, this makes you feel all the feels, and subscribe, and come back, and it promotes word-of-mouth, which is, I know, something you care deeply about, Jay. It's six minute to ten minute episodes, so I don't think it has to be long form. Jay Baer: Yeah, I think that's what we're going to do on Talk Triggers, is do a show like that. Six minutes, here's another example that we didn't have in the book, and just kind of talk about cool stories. Jay Acunzo: Well, can I make an observation about that six minute container? Jay Baer: Yeah. Jay Acunzo: It's not ... People would say, "Well, I don't have five hours extra. I have five hours a week, I'd like to add five more hours but I don't have it." I'm like, "Okay, well it's not actually about adding time, or even budget, it's about how you use those five hours. Maybe instead of constantly trying to reach out to bigger and bigger guests, which seems to be the lone growth tactic behind a lot of these podcasts or series that brands create, perhaps you should re-engineer the concept of the show. Perhaps you should, instead of doing an interview, script it and write it. Perhaps you should spend some time training yourself to be a better host, because the talent is 99% of the issue, not the technology." It's about how you use the time allotted. It's not this idea that you have to create something akin to an NPR or an NBC. Jay Baer: Whatever your show is, there has to be some sort of an amplification strategy. You can't just build it and people will not come, typically. When you are thinking through shows at Unthinkable Media, do you map out the social media elements of the show ahead of time, or do you make the show, test the show, and then figure out how to give people that taste of it in social media? Jay Acunzo: Interesting. The kernel of the whole project is, predictably, if you know anything about maybe TV, pilots. We first go with a pilot episode, if we're going to commit to a show. There is a step prior, which is that we don't know what the show's going to be about, but we want to make one, so we start lobbing out strongly-opinioned articles, tweets, just social posts. All we're looking for is a strong emotional reaction from a few people. We're not looking for viral success, we're not looking for some kind of metric beyond, do people comment and share this with a visceral response to it. A-ha, we have found the concept that they feel is either under-served in the marketplace, or at least under-addressed by other brands. Great. Jay Acunzo: Then, we make a pilot, and that pilot is a fully-produced half-length episode that we send to a group of VIPs. That could be the people who follow you on social, or that could be, perhaps you take them off social and go to an email or something like that. Then, to your question of what's the plan, based on the learnings from that pilot ... We're looking for how we articulate the big idea, we're looking for what were the key moments in this pilot. Very similar to writing a book, Jay. You kind of go on a little public tour of the show. You're promoting a big thing, very similar to a book. It's a new product that you're promoting. We tease the big concept gratuitously. I'll give you an example. Jay Acunzo: Wistia just announced a documentary series called One, Ten, One Hundred. They paid a video agency a bunch of money to make three different videos all about the same product. The first video for a thousand dollars, the second for ten grand, and the third for a hundred-thousand dollars. One, ten, one hundred. Their concept that they're exploring is, what happens when you change the constraints of a project to the marketing? That's a great concept, but they don't need any series content to promote. Jay Acunzo: They started creating little, funny graphics, showing their mascot in One, Ten, and One Hundred. They're like, what happens when you change the constraints? Do things get out of hand or do they get better? Are a hundred Lenny's better than 10 Lenny's? They start teasing a lot of content around this idea, and then they point it all to a landing page where eventually the trailer, or the pilot episode gets embedded. We do a lot of, sort of, raising anticipation planning on social media, and then the natural impetus of a marketer to promote the thing gets a lot easier when the thing comes live. Jay Baer: I want to check that out, that sounds really interesting. Jay Acunzo: It's amazing. Wistia, to me, they're doing things the right way in that they're talking about creativity, not about the idea, but about how you construct a box. We talk about outside the box. I did a lot of research in the book about what happens when you actually have constraints. 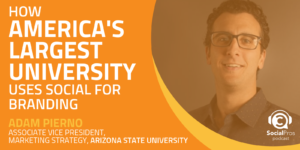 Universities have been studying this for decades, and almost unanimously, when you have clear constraints you are more creative, and the problem is a lot of times in the corporate setting we don't have clear constraints so we get frustrated and we think we want creative freedom because we run into an invisible wall because we didn't articulate that wall up front, or even worse, a leader articulates the walls of the box and then gets in the box with the team. Constraints yield I think better creativity, more ideas, and more effective ideas. Jay Baer: You use social media to promote your work as one would expect. Jay Acunzo, author Break the Wheel, what is your favorite social network? Jay Acunzo: Oh my goodness, it has to be Twitter for me because I mean it's such a cesspool in the broader world, but business Twitter- Jay Baer: It's a cesspool but in a good way. Jay Acunzo: Oh my God, I feel shielded from it. I think a lot of people listening would agree. Marketing Twitter, business Twitter is generally void of true trolls. They have a whole lot of company level problems we don't have to get into, but at least our little bubble is quite a delightful one. For me I do five to six one on one video calls with listeners to my show every month because I learn so much, but the engagement, the depth of relationship, and the insights that I get from those calls is pretty closely mirrored in Twitter, which is kind of amazing when you think about it because it's such a restrictive medium when you compare it to video. Jay Baer: Yes I like that a lot, it's well thought through, absolutely. I also want to ask you about your background. You've had a lot of interesting jobs for a lot of interesting people, and now you find yourself is making documentary style shows for B2B brands, writing books, giving speeches, Jay's an extraordinary keynote speaker friends if you haven't had a chance to see him on stage I highly recommend you take advantage of it if you have the opportunity. How did this happen? This seems like an interesting career arch. Jay Acunzo: I mean this isn't pandering, social media. 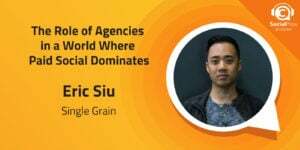 I started as a sports journalist but then my first job out of school was at Google where I was a digital media strategist, which was a fancy title that meant I knew a lot more about the AdWords product than my brand and agency clients. I was a guide into the product for Google. Along the way, social media became a thing that Google started to worry about and arguably still does. I started to teach my clients how to use social media because I'd been using it personally to create side projects. Back to the sports thing, I would write little opinion pieces on a personal blog. I was a Yankees fan in Boston Jay, so I wrote the blog Cranky Yankee Fan. It just happened to be that it forced me to understand social media. All of these side projects, bit by bit, launched me forward. I called them slingshots because, to the speaking, I reached out to our good friend Andrew Davis who used to live in Boston where I used to live and we connected and he started teaching me the craft of public speaking. Jay Acunzo: The podcast came about because I would interact with hosts and got a couple of recommendations for what to listen to and I fell in love with the medium, I decided to try it myself. The only way I knew how to get any listeners was to go through Twitter, was to go on Facebook, or LinkedIn. Bit by bit through side projects I went from Google, to HubSpot, to now as a full-time keynote speaker, author, and documentary creator. It's a weird set of jobs that I hold, but if you look backwards it's because I kept lobbing things out to social and using audience feedback to refine my skills in what I was doing and also find, not a lot of people, but the right people to push my career ahead. Jay Baer: You mentioned at one point that you left Google because of a pre-role ad, which seems like a very strange reason and rationale for leaving Google. I mean maybe it's a great rationale but at first glance, and I don't know this story, it seems a little bizarre so I'd like you talk about that just a little bit. Jay Acunzo: I love that you brought up this story. I was getting a little bit disillusioned by the big company feel and it's no surprise that I'm now an entrepreneur, but this was probably somewhere between '08 and '11, which is when I was at Google. Someone sent me one of those YouTube videos that we've all experienced before where you watch it once and you're like, "That was so amazing, I'm going to watch it again right away." I probably watched this thing five or six times throughout the day. Then I go home and I was younger, before I was married. I had three roommates and I said to those roommates, "Guys this is the greatest video of all time." I was hyping it to them and it turns out that's a very useful skill when you eventually become a speaker. I was honing that Skill Jay, I was selling this video on my three friends and I put the laptop down on the table, and I opened the laptop, and I'm talking it up, and I navigate to the URL and I'm like, "All right, are you ready?" They're like, "We're ready." I'm like, "Okay, get ready." Jay Acunzo: I hit play and of course what happens but a pre-roll ad smacks us in the face and it took all of the air out of the room. I felt like an idiot because here I was over-hyping it and then I had to be like, "Oh, ah so we just wait 30 seconds and then I promise it'll be great." Not only did I feel terrible but I had a very succinct thought in my head, which was very strange for anybody who didn't know what I did for a living. 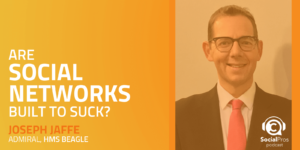 My first thought when I saw this ad was dammit Eric, dammit Eric because Eric was my colleague at Google who sold this advertiser on the idea of using YouTube and here I was seeing the fruit of his labor and it was a frustrating experience. Jay Baer: You knew. Jay Acunzo: Yes. Jay Baer: You knew where it came from. Jay Acunzo: Dammit Eric, and then I had a really terrible thought, like sinking feeling in the pit of my gut, which was will I have the same job at Google that Eric has? That means that somebody somewhere was having a- Jay Baer: You are Eric 2.0. Jay Acunzo: I'm Eric for somebody else, bingo. With Google's scale that's not one somebody else, that was thousands, tens of thousands. If I was doing my job well Jay, literally millions of people had a worse moment in their day because of something I did for a living, and that is not why I got into marketing and media. That is not what I love about my job. Jay Baer: You probably shouldn't have gotten into marketing and media at all if that was your primary concern. Jay Acunzo: Well I want to make- Jay Baer: [crosstalk 00:36:26]. Jay Acunzo: No, no, no, I want to make things that make me feel and make other people feel too. It turns out that that is the best way to practice any kind of marketing strategy today. You have to be the object people choose. Jay Baer: [crosstalk 00:36:37]. Yes, I've said it a million times on this show and others. The real secret is to be somebody's favorite podcast, and if you can't do that then you shouldn't have a show. Jay Acunzo: 100%, that's why I started Unthinkable Media because so much content about ... I focus on B2B brands, but so much content about the workplace, B2B, is commodity stuff. It's boring and bland and predictable, it lacks insight, it's going through the motions, but that's not how you want your career or company to unfold so we can elevate that plane, we can be more refreshingly entertaining. In that moment Jay I was like, "This is not what I got in the business of making stuff on the internet to do. I don't want to be the interruption, I want to be the thing that you're frustrated that somebody else interrupted." Jay Baer: I feel like the giveaway for your book, we've got the [inaudible 00:37:23] for our book. I feel like your book giveaway should be t-shirts that just say, "Dammit Eric." That should be your hook. Jay Acunzo: I love that. Unfortunately Eric is a good buddy of mine so I don't know if I'd want- Jay Baer: It doesn't matter because it'll be fine. You know what? It's all good. Jay Acunzo: He would wear it too. Jay Baer: Let bygones be bygones. Jay Acunzo you are the man, the new book is Break the Wheel, Question Best Practices, Hone your Intuition and Do Your Best Work. Jay is also the founder of Unthinkable Media. Jay I want to ask you the two questions that we've asked every guest here, 350 episodes whatever. I can never remember the episode number. Jay Acunzo: Man congrats. Jay Baer: It's one of my flaws. What one tip would you give somebody who's looking to become a social pro? Jay Acunzo: There are several stories in the book that support this but focus, especially when you're going down a new avenue, focus not on large top line final success, focus on a small number of people reacting in a big way to what you're doing. In the book I call these true believers, so I think we obsess overreach Jay, but we really need to get better at finding and- Jay Baer: Resonance. Jay Acunzo: Using resonance, bingo. Jay Baer: Yes, I love that thing that you mentioned about testing the premise of the show and not looking for viral spread but more a small number of deeper reactions. Not to mention the fact, our listeners know that that's actually how the algorithm is tuned today, especially on Facebook. It's not necessarily about total number of likes, it's about longer form comments and deeper interaction. That's really what Facebook is looking for is depth of reaction, not breadth of reaction. Not only is your advice well founded, it's also very much on trend. Jay Acunzo: In 20 seconds you just revealed something huge Jay, I want to point it out. There's a lot of people out there that rely on engagement groups, they're part of a little community group, say on LinkedIn. They're like, "I'm going to post something on LinkedIn. Everybody go up vote it." I'm like, "Okay I know you're gaming the system trying to get reach, but you're actually missing the opportunity to see if, without you touching it, people actually deeply engage. You've lost the ability to find signal and insight by asking other people you already know to engage." Focus on resonance, what I call unsolicited response rate, let's just call it URR because it has to be an acronym. Focus on URR in an organic way, don't try to game it because that's how you get real meaningful signal. Jay Baer: Yes, I love that URR, that's really terrific. I mean that's the thing, I've never ever and I'll say this, this may surprise listeners but I have never in my entire career been a part of one of those rings. I just don't see the point of it. Doing that is like asking your mom aren't I awesome? It's like well yes, I mean your mom is going to say that presumably or you got a real mom issue. I just don't see the upside. Jay Acunzo: It's about investing smart. Invest in the things that are actually are working, not the things you force to work. Jay Baer: Yes there you go. Last question for Jay Acunzo is, if you could do a video call with any living person who would it be? Jay Acunzo: It's such a tragedy that we didn't speak earlier this year because my instant response to all these questions used to be Anthony Bourdain because oh my gosh did he influence my career and my storytelling style, even in the workplace when I talk about B2B stuff. Man, anybody but him I think someone I do admire is a Mike Rowe. I just love the way his principles come through in every single thing he publishes and I'd really want to know how he structures and lives his career dreams out because he has 17 different projects or something crazy, I don't know if it's 17, and that's how I want to structure my career. He's got the one big thing and has a lot of side projects. I'm trying to build a business along those lines, and so not only do I respect and admire his skills, but I'd want to know operationally how he's doing the magic that he's doing. Jay Baer: Yes, and it seems like he'd just be a super fun guy to hang with. Jay Acunzo: That's true too. You can see he's a real down home guy. I can see him getting the good cheap beer with you out on the lawn and just having a good time. Yes, I would go with Mike Rowe. If we can't do a video call it would definitely be beers. Jay Baer: Yes, and as a guy who used to be an opera singer he seems pretty well adjusted. Jay Acunzo: Oh my gosh, the voice. You and I are podcasters but we do not have those pipes. Jay Baer: No, he's like a Scott McCain kind of guy, he just has the purity of tone, which is God given for sure. Jay Acunzo: Yes sir. Jay Baer: Jay thank you so much for being here. Congratulations on all the success, especially the new book Break the Wheel. Ladies and gentleman make sure you go out and get a copy. It's available on all the places and ways that books can be procured. Jay where would you like people to go get the book? Jay Acunzo: You can hit it up on Amazon, but jayacunzo.com/book has all the context you need. I also published the Spotify playlist that I actually used to write the book, which I think a lot of people in marketing find pretty interesting because they too have aspirations to write stuff. That's jayacunzo.com/book. Jay Baer: Jayacunzo.com/book, we'll make sure that is linked up in the show notes, which of course ladies and gentleman will be located at socialpros.com where every single one of our many, many, many, many episodes are chronicled. You can get the full transcript of the show, all the links, including those just mentioned by our guest, and of course all the recordings dating back all the way until 2011 or '10 or some damn thing. Next week my pal Adam Brown will be back on the microphone, we'll have another spectacular guest. If you get a chance we'd love to hear from you. You can always email me directly Jay@jaybaer.com. Leave us a review wherever it is that you listen to podcasts. We treasure the time of each and every one of you. On behalf of Adam Brown from Salesforce, I am Jay Baer from Convince and Convert. He is Jay Acunzo, the author of Break the Wheel. This has been Social Pros.